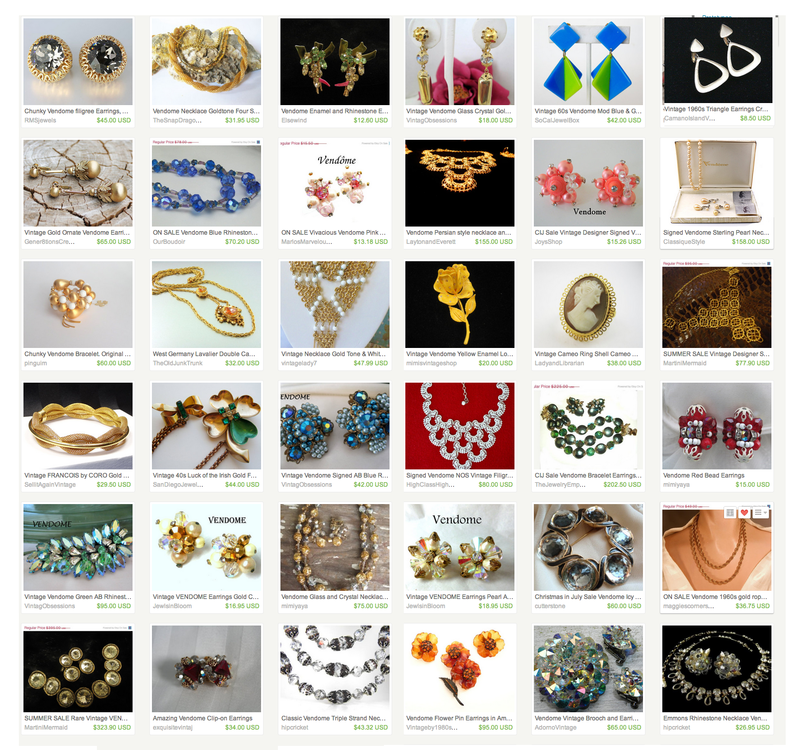 Vintage Jewelry Sellers on Etsy: I Love Coro Jewelry Because . . . 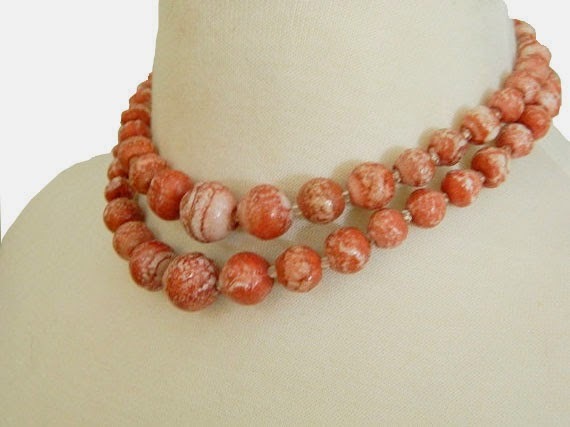 I Love Coro Jewelry Because . . . 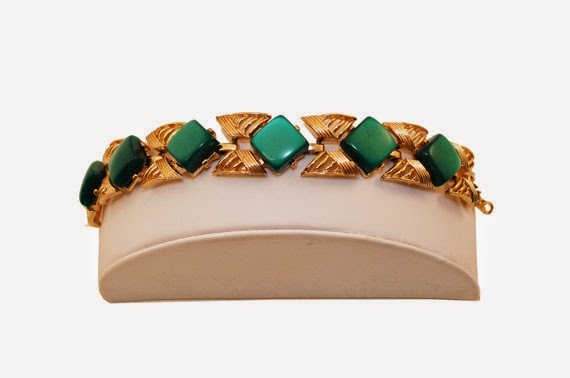 If you’ve been collecting vintage jewelry for any period of time, you’re sure to have come across a piece or two of Coro. 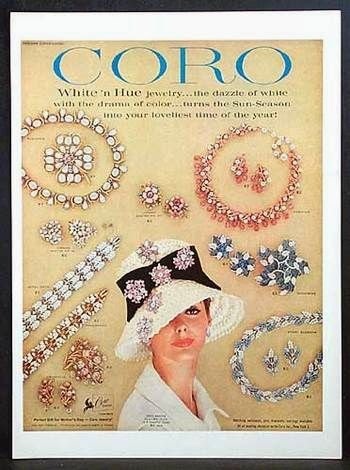 Once one of the leading names in costume jewelry, Coro was established in 1900 in New York, by Emanuel Cohn and his partner Carl Rosenberger, as the Cohn & Rosenberger Company. A fun little piece of trivia, the name Coro wasn't actually adopted by the company until 1943, when the blend of Cohn & Rosenberger's names was officially made the corporate name. Cohn had died in 1910, only 10 years into the life of the company, but the Rosenberger family still gave tribute to his contributions to the brand. Carl Rosenberger continued to manage the company until his death in 1957, when the brand was taken over by Gerald Rosenberger, Carl's son, who managed the company until his death 10 years later. In 1970 the Rosenberger family sold the company to Richton, International. However, Richton was unable to keep the line profitable and in 1979 Coro went bankrupt and closed its doors for good. 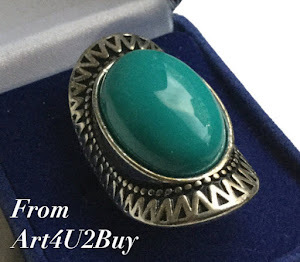 For vintage collectors this means that any piece of Coro jewelry you find is at least 35 years old and is definitely vintage. All Coro pieces are marked, making them easy to recognize and collect. The company had many different jewelry lines with Coro, Coro Craft (Corocraft) and Vendome the most popular. In addition, the logo went through many iterations, the two most popular versions being the script “Coro” and Pegasus Coro, with the image of a flying horse next to the company name. Adolph Katz became the company’s design director in 1924 and although his name is on most Coro design and mechanism patents he did not directly design jewelry. 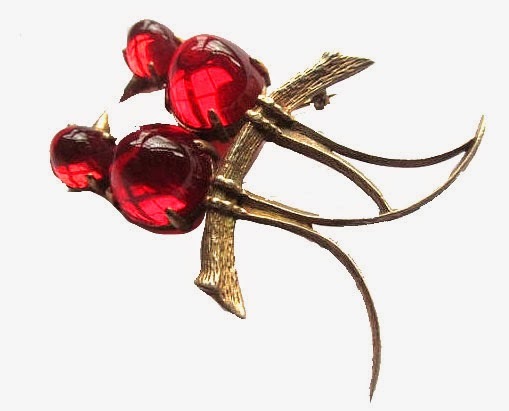 Katz's main role was establishing the design direction of the company and hiring the many noted Coro designers including Gene Verrecchia (Verri), Robert Geissman, Massa Raimond, Oscar Placco, and Francois who went on to found his own line of floral jewelry. The most successful of the Coro designers, Albert Weiss, went on to establish his own eponymous company concentrating on rhinestone jewelry. You can find our article on Weiss here. Although Vendome was considered the most high end at the time, many collectors now consider the Coro Duette line one of the most desirable pieces made by the company. 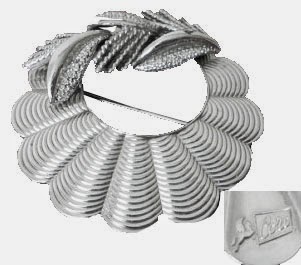 Duettes had two pins or dress clips in a frame making one large brooch. The frame allowed the removal of the pins to wear separately or in a grouping. 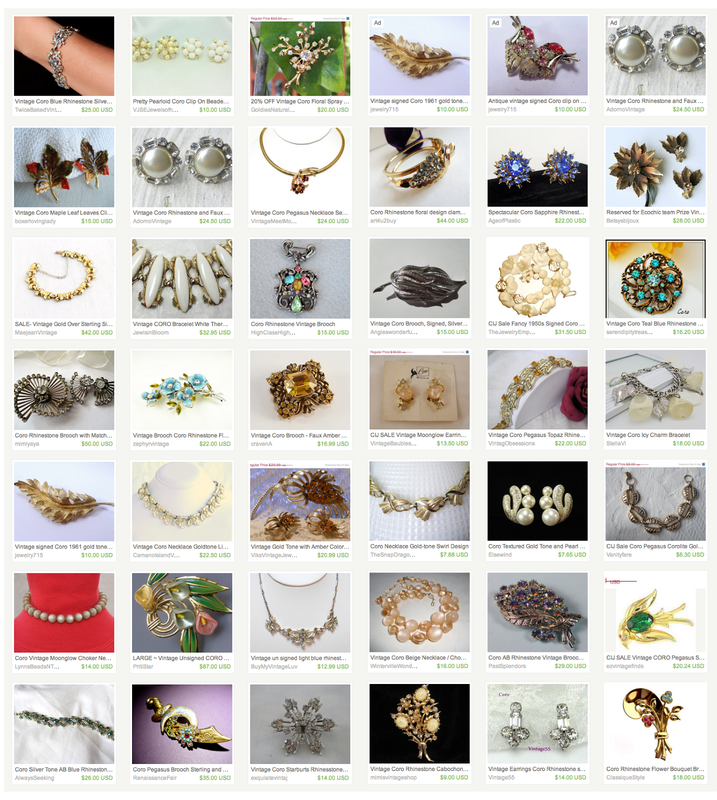 The earliest designs were classic rhinestone art deco patterns. 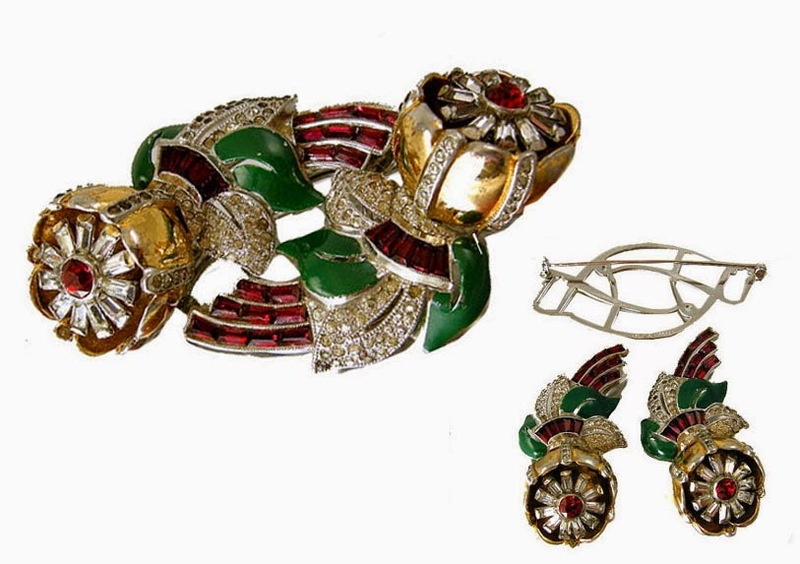 Later pieces included more elaborate designs of plants, animals and people, incorporating rhinestone pave and enameling. shows the construction as well as the exquisite design. Another popular Coro collectible are the trembler (en tremblant) floral pins with design elements that vibrated or trembled when its wearer moved due to tiny metal springs hidden in the piece, see the above Duette piece. In the 1950s Coro launched silvertone and thermoset moonglow lines, both of which are very popular today with collectors of mid century pieces. The Corocraft line debuted in 1933 and was considered a step up from Coro. 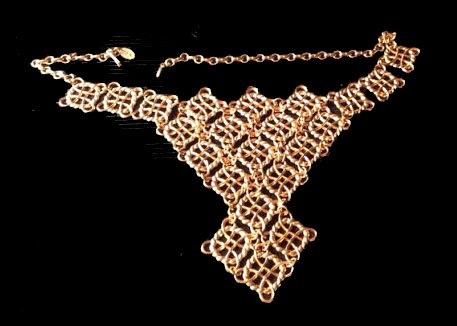 Corocraft pieces were often made of sterling or plated gold rather than the metal frames of Coro. One of most collectable of Corocraft pieces were the jelly bellies which featured animals with a Lucite “tummy” and were similar to a design by Trifari. Vendome, established in 1944, upped the quality even more under principal designer Helen Marion with elaborately foiled beads, carved Lucite, and rhinestone and cabochon pieces Due to the large number of product lines that produced many different designs over the years there is no one signature look for Coro. This means whether you love deco, mid century or just a lot of bling you are sure to find Coro pieces that match your taste and budget.